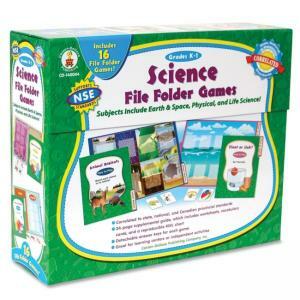 Skill-building science games are ideal for learning centers or independent study. Preprinted in full color on the file folders save you valuable time. All you need to do is cut and laminate the game pieces. Games are color-coded for easy cleanup. Included 16 games cover earth and space, physical, and life sciences. Games include climate, food groups, parts of the body, parts of a plant, solids and liquids, objects in spaces, living and nonliving, as well as dressing for weather.